Police believe those who headed to the Witterings beach area on Sunday may have witnessed a collision in which a motoryclist sustained ‘fatal injuries’. Police said a 56-year-old motorcyclist from Worthing was flown by air ambulance to Southampton General Hospital after the incident at 12.30pm on the A286 Main Road at Birdham, near Chichester, but died of his injuries. A police spokesman said the BMW motorbike he was riding collided with a Jaguar travelling in the same direction, close to the road’s junction with Walwyn Close, Birdham, before a secondary collision with a Mercedes-Benz A180 car travelling in the opposite direction. 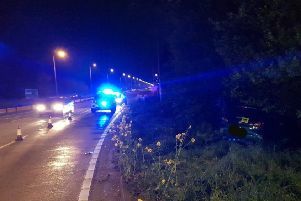 He added that neither the Jaguar driver, a 28-year-old man from East Grinstead, or his passenger, a 26-year-old woman from the same town, were hurt. Nor were the other car driver and his passenger, a man and a woman, both aged 30 and both from Chigwell, Essex. The crash caused significant traffic delays and the A286 was closed for four hours while the incident was dealt with. Consequently, people are being urged to spread word of the collision and the need for information as extensively as possible.